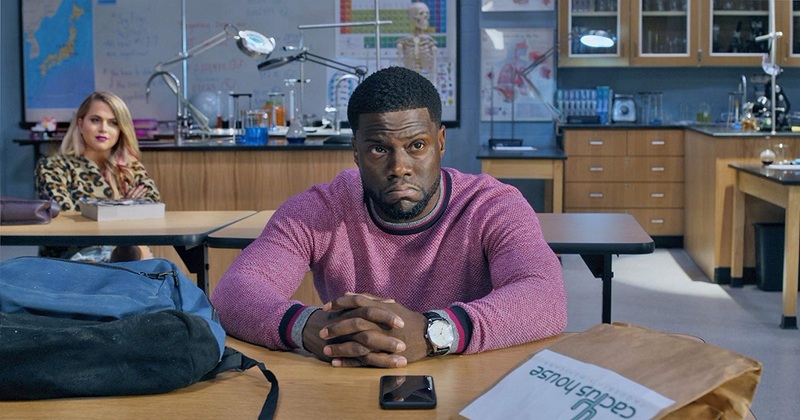 After he loses his job as a salesman when his place of employment literally goes up in smoke, it quickly becomes apparent Teddy Walker (Kevin Hart) isn’t going to find another well-paying job anytime soon without a high school diploma. As such, his best friend Marvin (Ben Schwartz) convinces him to head back to their old stomping grounds, Atlanta’s Piedmont High School, and get his GED. Unknown to both of them, Teddy’s former nemesis Stewart (Taran Killam) is the current principal, and he’s looking forward to seeing the guy who mocked him as a kid fall flat on his face when he fails to pass the test. 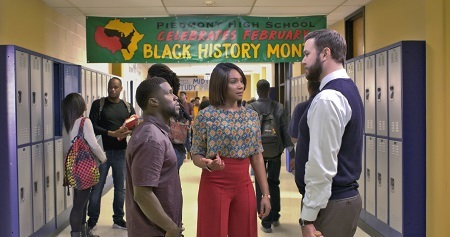 But determined teacher Carrie (Tiffany Haddish) isn’t interested in seeing any student, even her night school adults looking to get their GED, not live up to their potential, and she’s determined to do whatever she can to see all of them, including Teddy, succeed. 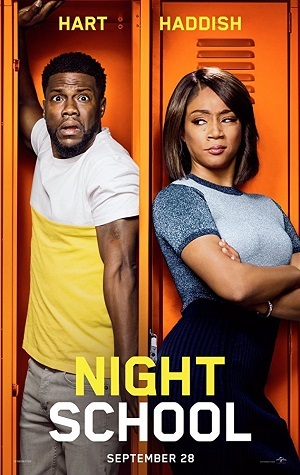 Night School, not to be confused with the gender-flipped 1981 cult favorite slasher film of the same name, has a lot more on its mind than reveling in a bunch of adults making fools of themselves by engaging in a number of ribald juvenile high jinks. Director Malcolm D. Lee, the man behind Girls Trip, The Best Man Holiday, Roll Bounce and Undercover Brother, attempts to make a movie that celebrates the power of education while also generating a number of laughs that hopefully come from a place of character-driven authenticity. His goal is to balance drama, humor and a bit of social commentary in much the same manner as he has in his previous efforts, hopefully entertaining and enlightening the audience in equal measure as he does so. Unfortunately Lee can’t pull it off. Working from a script credited to six different writers, a list that includes Hart (who also produces), Nicholas Stoller (Neighbors) and John Hamburg (Zoolander), this comedy is a hodgepodge of ideas, subplots, concepts, jokes and melodramatic contrivances that never coalesce into a coherent whole. It’s a messy, unfocused comedy that feels continually out of balance with itself, almost as if Lee and his talented cast are desperately searching for a way to make all of this work in a way that doesn’t feel forced or false. While there are some laughs, while a few solid dramatic moments are to be found, on the whole nothing ends up working, the final film a frustrating misfire that sadly proves to be a waste of time for almost everyone involved. Which is a shame because there are a lot of nice things happening here, not the least of which is Haddish’s committed and surprisingly fiery performance. Carrie has a lot to say about her job, what it means to her and why education matters. 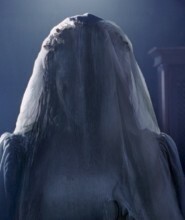 Additionally, the character also finds time to make more than a few salient points about the educational system as a whole, and while some of them might come off as overly glib or slightly flippant, these remarks still allow the actress to display an agreeably dynamic serious side she doesn’t typically get to show. I also like that a number of the supporting players are given room to shine, most notably Mary Lynn Rajskub as one of Teddy’s fellow night school classmates, the “24” and “The Girlfriend Experience” veteran making the delightful, energetic most out of every scene she’s involved with. It’s also nice to see a movie that attempts to showcase a platonic relationship between its two leads, allowing them to have separate lives out of the classroom that have nothing to do with one another. But the rest of the night school class? It’s as if all of them, Rob Riggle, Romany Malco, Al Madrigal, Joseph “Fat Joe” Cartegna and Anne Winters, aren’t working from the same page. There are long stretches where I felt like they were all in a different movie, as if each actor had been dropped into this story from a storytelling planet located at opposite ends of the universe. The melodramatic bits and the raunchy bits never gel together in satisfying fashion, while almost any moment that Killam is involved with (save a post-credits bit of silliness at his high school’s prom) falls flatter than a pancake run over by an out of control steamroller. Yet the biggest problem is Hart. As funny as he can be at times, he’s just all wrong as Teddy. His performance is too broad, too cartoonish, too all over the map, his entire presence a cacophony of energetic tics and tricks that grow increasingly tiresome as the story moves forward. 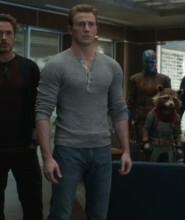 Hart’s antics are more annoying than they are anything else, and as Teddy is supposed to be someone the audience is supposed to grow to love the fact I wanted to watch every other character in the movie make something out of themselves other than him is undeniably a giant problem. Hart overplays his hand to such an extent he ends up slaughtering any chance the dramatic moments ever had of proving to be effective, and all I could do as the story continued was wonder how much better all this might have been had Lee reined his star in even a little bit. There are other issues, most of a relatively minor variety that sadly begin to add up into being hugely problematic over the course of the film’s 111-minute running time. The thing is, as hit-and-miss as I personally find Lee’s filmography, the truth of the matter is that he’s got a pretty solid track record of being able to balance comedy, drama and a social conscience rather nicely. The fact Night School is such an unacceptable catastrophe on that front is rather unbelievable, the whole project flunking its final exam so thoroughly and I can only imagine it will be expelled from theatres relatively soon.